Primitive Autumn Fall Saltbox House Hand Painted Tissue Box Cover. Autumn Fall scene with a antique white saltbox house with fall tree and pumpkins. 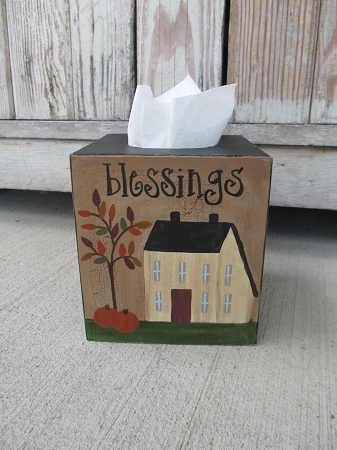 This is my design from the personalized fall saltbox plate, but now on the tissue box. You can customize yours with the sides of the tissue box color to match your decor. Blessings is the saying. Holds a boutique style tissue box. Sealed for easy dusting, paper mache. Size is 5"x 5 x 5 1/2". Hand painted, designed and signed by Heidi.